Rather than simply dump at landfills, 1st Choice Disposal believes in doing everything possible to reduce the strain on the environment and help people whenever we can. What is junk to some people is useful to others. 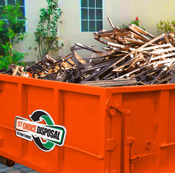 1st Choice Disposal goes through every bin full of waste and removes any materials that can be recycled or reused. We believe that while we’re in the disposal business, we’re still responsible to ensure on behalf of our clients that waste is minimized. We deliver and pick up our bins throughout the GTA.